This is a close-up photograph of a SEPTA token, which is about the size of a quarter. It reads, "GOOD FOR ONE FARE" on this side; the other side reads, "SOUTHEASTERN PENNSYLVANIA TRANSPORTATION AUTHORITY". You will observe that it is composed of two different metals; the center strip is there, to convey to the automated fare box or turnstile that the SEPTA token is genuine - and you can board. SEPTA tokens can be convenient, faster, and cheaper than paying cash. However, they can also be very confusing, particularly if you're not familiar with Philadelphia and/or SEPTA - and especially if you're from out of town, or a new resident. So, here's a comprehensive guide to SEPTA tokens. What Is A SEPTA Token? The SEPTA Blue Line - also known officially as the Market-Frankford Line, and unofficially as "The El". The Broad Street Subway - also known officially as the Broad Street Line, the SEPTA Orange Line, and unofficially as "the subway". The Norristown High Speed Line - formerly known for decades as the "Route 100 Trolley", which runs from the western end of the Blue Line - 69th Street Terminal at 69th and Market Streets, far from visitor territory - to the Norristown Transportation Center in suburban Montgomery County - even further from visitor territory. While doing so, it travels through the western suburbs known as the Main Line, as well as King of Prussia. How Much Do SEPTA Tokens Cost? 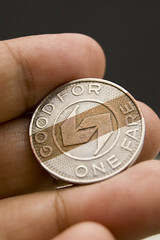 SEPTA tokens cost $1.55 each - $0.45 cheaper than the $2.00 you'd have to pay in cash. However, you must buy SEPTA tokens in packs. SEPTA will sell them to you in packs of 2, 5, or 10. A 2-pack costs $3.10. A 5-pack costs $7.75. A 10-pack costs $15.50. As a general rule, this is not a big problem, since odds are if you are taking SEPTA somewhere, you will need a pair of tokens- one for the way there, and one for the way back. However, even if this doesn't fit your situation, you can't buy just one. They won't sell it to you. If you need many SEPTA tokens - for example, if you and your large group of friends are going out on the town in Old City Philadelphia, for example - you can, of course, buy whatever number you need - just figure out how many sets of 2, 5, or 10, you may want. There is no discount for an individual person, buying SEPTA tokens in bulk, though. Why Am I Bothering With SEPTA Tokens, Just To Save $0.45 Each Way? Particularly if you are from out of town, or a local unfamiliar with Center City, you would prefer to blend into the SEPTA system, as much as possible. This is particularly true on the Blue Line and the Broad Street Subway, especially at night. Regular commuters use tokens or passes. Hence, if you use tokens or passes, you are inconspicuous and look like you're a native, and less of a potential target. Instead, you just quickly drop your token in the turnstile, or in the fare box, and you're on your way. It's a lot more convenient, to carry your fare, in the form of a SEPTA token - that is, a coin the size of a quarter - than two dollar bills, or a handful of coins, or one dollar bill and a handful of coins. That transaction - or not having to conduct the transaction - can be the difference between making the train speeding into the tunnel, or waiting 15-20 minutes for the next one. (Trust us, we know from firsthand experience.) Spend your time in town enjoying Philadelphia attractions, not waiting on SEPTA platforms. Where Can I Buy SEPTA Tokens? 30th Street Station, at 30th and Market Streets - which is also the Amtrak Station. You can also buy them from token machines, located in most SEPTA City Transit stations (i.e., Blue Line and Orange Line stations, not Regional Rail stations). Note, though, that the machines require exact change - but at the window, the clerk can provide change. Also, the machines are not always working properly, and even if they are, sometimes they just run out of tokens. So you can't always count on being able to buy them at a particular station. If you buy SEPTA tokens at the ticket window, you'll receive them in a small plastic bag, which you have to tear open and throw away. If you buy them at the machines, you'll receive them loose. Can I Use SEPTA Tokens On SEPTA Regional Rail Trains? You might reasonably ask, "They say 'GOOD FOR ONE FARE' right on them! And I can buy them at SEPTA Regional Rail ticket windows! Why aren't they good on the train?" Unfortunately, they're not. SEPTA tokens literally have no value on trains, not even a discount of any kind. The reason is that SEPTA Regional Rail and SEPTA City Transit are different divisions; you can use some passes on both, but not all. Bottom line, for our purposes - you can't use SEPTA tokens on SEPTA Regional Rail, i.e., "the train", as opposed to "the el" and "the subway", where you can use them. Can I Use SEPTA Tokens On the Purple Phlash Trolley? No, unfortunately. You have to pay the $2.00 base fare to ride the purple Phlash Trolley - which we, of course, enthusiastically recommend, during the six months of the year in which it operates, and before it shuts down at dinnertime. Will My SEPTA Tokens Ever Expire, And/Or Lose Their Value? No, at least not under the current rules. This is in contrast to train tickets, which can and do expire. And all SEPTA passes are finite - they lose all of their value after a certain date, or at the end of a 24-hour day. However, SEPTA tokens, in theory, are perpetually valid. The only way they would ever expire, is if SEPTA changes the rules, and/or when they implement the next development in transit technology. Thus, the fact that SEPTA tokens don't expire, is another benefit to using them. You can keep a few of them in your bookbag, briefcase, etc., and they'll always be good. If you'd like to leave SEPTA Tokens and return to the SEPTA Main Page, please click here.